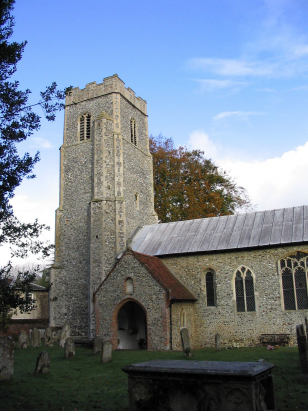 The parish of Swardeston lies just south-west of the city of Norwich by about 4 miles, the village sits on the B1113 road which links the city with the villages of Mulbarton and New Buckenham. The village is a tight concentration of dwellings along a roughly half mile stretch of the B road with outlying farms and cottages to both west and east. There is still a village centre which has been saved as Swardeston has become a commuting centre for the city. St Mary's church lies towards the southern end of the village tucked away up an unsurfaced track. 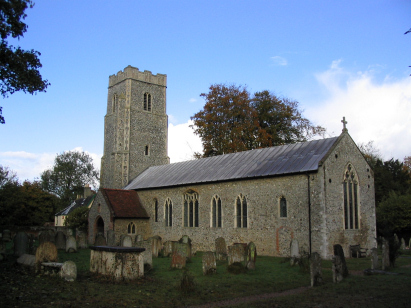 The church has a delightful mixture of ages from Norman onwards but the majority is of the typical 14th Century Perpendicular style found across most of Norfolk. The doorway is untypical being of Tudor period with brickwork reminiscent of the major house building of that period. A single standard 800-entry register book covers the period of this transcript and indeed continues beyond until completed in 1901. This register book is filmed on Microfiche 5 & 6 in the collection of the Norfolk Record Office and from which this transcript was produced. The fiche are unfortunately rather elderly with images typical of that period of filming e.g. faint and hazy with little contrast. It is probably to the credit of the incumbents that reading these images was straightforward and posed few difficult "reads". As a result this was a straightforward transcript to prepare and it is to be hoped few errors will have crept into its compilation.